As of July 2012, according to the Department of Veterans Affairs, there were more than 22 million veterans in America — roughly 7 percent of the country’s population. The last surviving veteran of World War I, Frank Buckles, died just last year at age 110. But many men and women at least a quarter of that age are returning from Iraq and Afghanistan every day. Documentary photographer Ashlei Quinones’ portrait series “Indivisible” shows a handful of these new veterans in various phases of reintegration to civilian life. 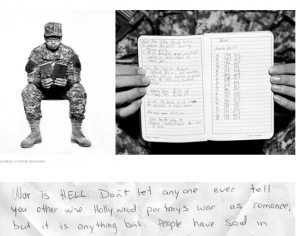 To do that, Quinones encouraged the veterans to speak for themselves, in the form of a handwritten letter. Their words express pride and grief, hope and despair — conveying the ambivalence of what it must mean to fight a war, and to return home with those memories.